After leading through much of the year, the Mercedes-Benz C-Class will now need to outsell the BMW 3-Series by 305 sales in November and December to end 2012 as Canada’s best-selling premium brand vehicle. Through three quarters, the C-Class Benz was leading the BMW by 428 sales. That lead disappeared in September and switched over to a big gap in the 3-Series’ favour last month. Year-to-date, the 3-Series is off last year’s pace by 1.1%. But over the last three months, 3-Series sales have jumped 39% compared with the same period in 2011. 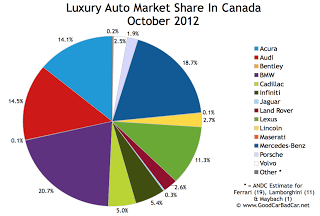 17 of Canada’s 30 best-selling luxury vehicles in October 2012 were SUVs or crossovers, including the second-ranked Lexus RX, which sells 4.4 times more often than the 30th-ranked Range Rover Sport. The Audi Q5 ended 2011 as Canada’s ninth-best-selling luxury vehicle. Ranked fourth in October, the Q5 is positioned as the fifth-best-selling luxury vehicle in the country through ten months. The Q5 is 340 sales behind Audi’s own A4, which now includes the Allroad, but not the discontinued Avant. The Q5 and A4 were just two of four Audis listed among Canada’s 30 best-selling luxury vehicles. The A5 and Q7 are only up slightly this year, but October was a particularly strong month for Audi’s coupe and biggest SUV. Combined, the Q7, better-selling Volkswagen Touareg, and slower-selling Porsche Cayenne found 551 buyers in October. That’s a small portion of the VW Group’s 7992 October sales, but it’s a meaningful number that we can contrast with Mercedes-Benz’s 414-unit M-Class total and Acura’s 497-unit MDX total. As will always be the case in the future, historic brand and corporate totals (monthly and yearly going back to 2004) are now available through the dropdown menu at GCBC’s Sales Stats page, along with results for more than 260 currently sold vehicles. That’s where you’ll find out that Hyundai sold 195 Genesis sedans and coupes in October. In fact, 101 of them were $39,999-$53,499 sedans. 1058 of the 2687 Genesis’ sold so far this year were sedans. Ranked by October 2012 volume below are Canada’s 30 most popular luxury vehicles. Their means of qualification are explained at the bottom of this post along with pertinent links to other best seller lists. GCBC qualifies all vehicles from Lexus, Mercedes-Benz, BMW, Acura, Cadillac, Audi, Infiniti, Lincoln, Volvo, Land Rover, Porsche, and Jaguar while also making exceptions for overtly premium cars like the Chevrolet Corvette, Nissan GT-R, Volkswagen Touareg, Hyundai Equus, and (reluctantly) Hyundai Genesis. Buick’s lack of anything truly high-end hinders its value-priced vehicles from qualifying as premium, despite the image Buick held in a previous era. Yes, this means the B-Class is eligible because of the S-Class; the A3 because of the R8, to an extent. Unfortunately the lack of data separating vehicle trim lines from one another (F-150 XL vs F-150 Platinum, for example) means vehicles like the GMC Yukon Denali and Jeep Grand Cherokee SRT8 aren’t included. None of this should lead you to believe the Chrysler 300 and Toyota Avalon and Buick Enclave aren’t luxurious, particularly as they’re viable competitors for true premium players.